Russian bonds retreated, and UBS Group AG recommended selling the rouble ahead of a U.S. Treasury report describing possible sanctions on Russia’s sovereign debt, Bloomberg reported. The imminent report has been the biggest reason deterring investors from Russia’s $120 billion rouble debt market since it was commissioned by Donald Trump in August. As the investigation of Kremlin election meddling in Washington reaches a critical stage, the report could serve as a basis for what M&G Ltd. has called the “nuclear option” for U.S.-Russia relations. Still, most investors attracted by Russia’s outsized real rates don’t see debt sanctions as a base case scenario. “During our trip to Moscow at the beginning of the year, nearly every single meeting contained some discussion of the potential expansion of U.S. sanctions in the nearest future,” Vladimir Osakovskiy, an analyst at Bank of America Merrill Lynch said in a research report last week. But “the risk of an escalation of sanctions is currently perceived as low,” he said. The yield on Eurobonds maturing in June 2027 increased 7 basis points to 3.94 percent, the highest level since December 4. 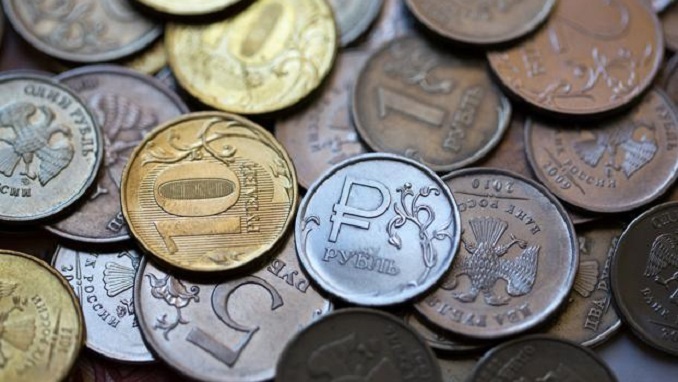 Rouble bonds also slid, with the yield on 10-year notes climbing 1 basis point to 7.31 percent. The cost of insuring Russian debt through five-year credit-default swaps rose for a second day, while the rouble was little changed. UBS Strategists Jonas David and Michael Bolliger shifted their rouble recommendation from overweight to neutral on Monday, citing the sanctions report which they said could trigger “some market volatility.” They also noted that the currency could be hurt by foreign currency purchases by the finance ministry and a correction in oil prices. One reason Trump’s administration may be reluctant to advise imposing restrictions is that such a move would hurt U.S. investors who have significant holdings in Russian debt. BlackRock Inc., Stone Harbor Investment Partners, and JPMorgan Chase & Co are the three biggest holders of ruble bonds with investments totaling about $4.9 billion, according to data compiled by Bloomberg.